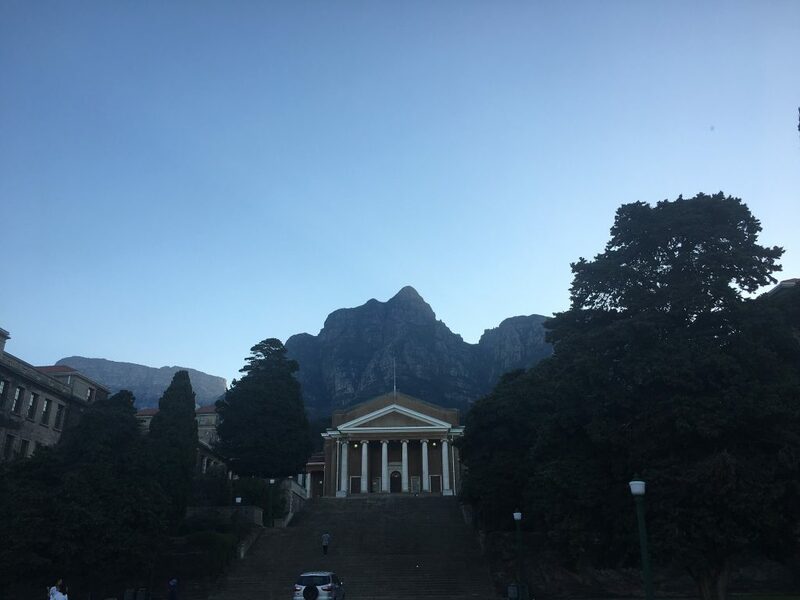 I arrived safely in Cape Town a week ago for my fall semester at University of Cape Town and began what I hope will be the adventure of a lifetime! When I landed, I met my study abroad program director at the airport to drive to where I’ll be staying for the semester: a small 7-person house in a little enclosed garden. The house seems like it will make for good community throughout the semester, but I just have to get used to using a space heater to warm up my room since its winter here and uncommon to have central heating. The winters in Cape Town get cool, around 50-60 degrees Fahrenheit and are very rainy, but the rain is much needed here because of the drought Cape Town is going through. The water reserves were recently reaching 14% of their capacity, but since the winter rains it is now above 50%, which will last the area until 2019 at least. Even though the water levels have risen, Cape Town is still considered to be in a drought. We are under water restrictions and have to try our best to limit our water usage. That means short showers, recycling shower water to flush toilets, not leaving the faucets running while washing dishes or brushing teeth, etc. It will definitely take some getting used to! Upper Campus at University of Cape Town, where I will be studying! My first week here consisted of full days of IES orientation, where IES staff members went over Cape Town culture, history, safety, and academics. The orientation was mostly made up of lectures, but we were able to do some fun things afterwards. On Wednesday a few people from a nearby township called Langa came to take us on a tour in order for us to experience Cape Town as a whole instead of just becoming familiar with the city. Townships are similar to neighborhoods surrounding the city and each one is unique, so the members of the communities have a lot of pride in their township. Langa is a Xhosa township, which is one of cultural groups and one of the 11 national languages of South Africa. Langa is made up of black lower and middle class South Africans. During orientation we learned that in South Africa 54% of the population is under the poverty line and only 13 percent of the total population make enough money to be eligible tax payers. These were significant and surprising statistics to learn. We were able to see some poverty first hand in Langa since the majority of the people are also under the poverty line. Mike, our tour guide, was born and raised in Langa and still lives there today. Because it is a such a strong community in this township, he said that few people tend to leave even if they have enough money to move to a wealthier township. It was also evident that there was strong community based on the amount of people that were outside together and the number of children playing in the streets with each other. Our first stop on the tour was the arts building, where there are a few different art programs. One of the programs is called Our City – Cape Town. This program is made up of various local artists who sell their work and put the profits towards funding for local youth to come after school and learn how to make artwork. It is a way for the young people in the township to learn a new skill and have something to do after classes. It seemed like a really good opportunity for the children because from what we saw in the township, they didn’t have toys to play with or access to the types of crafts or activities I grew up with. They were smiling and laughing and having fun but were playing with car tires and old storage crates. It was reassuring seeing how their community was providing them with opportunities like this art program since they are unable to have their own toys and other things many of us take for granted. 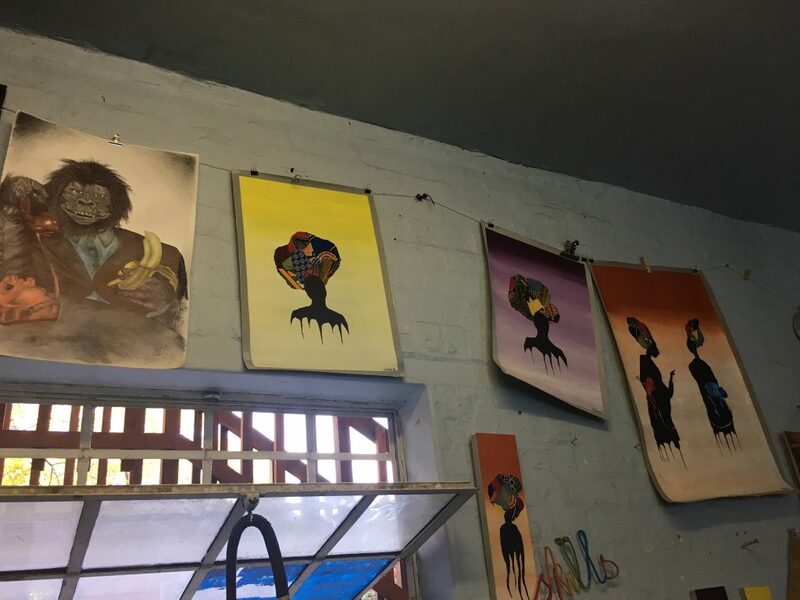 Some of the artwork created by local Langa artists being sold for the Our City – Cape Town program. 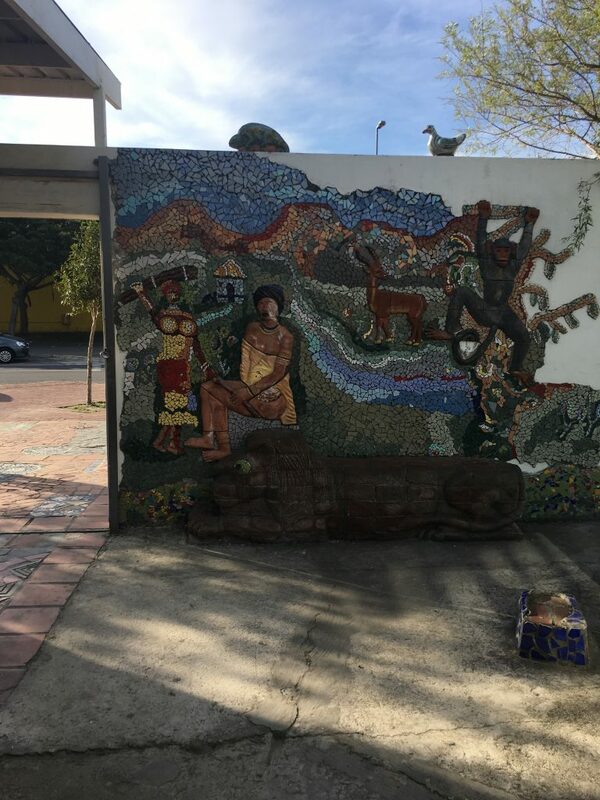 A mosaic wall outside of the Langa art building. The next stop was with street vendors cooking and selling sheep heads. In Langa sheep are a common and popular food, but they eat every part of the sheep, including the organs and the head. 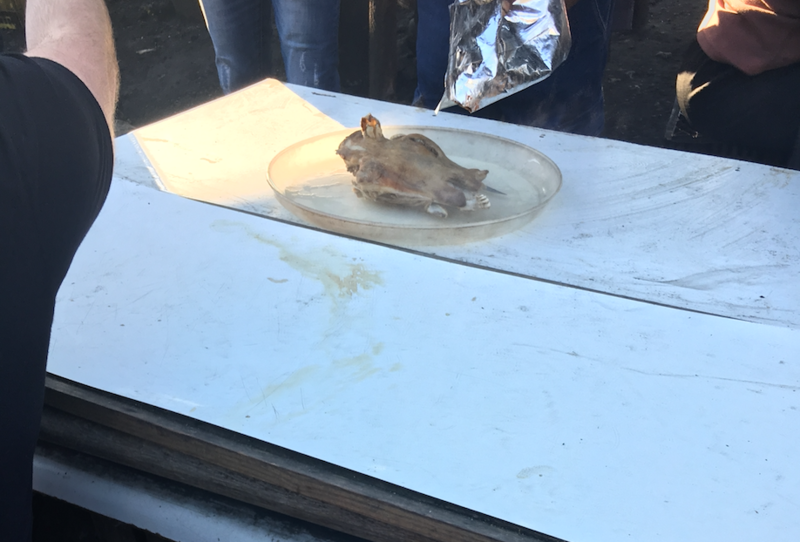 So, we were able to see how Langa women cook the sheep head and even got to try a bite! The idea of eating the face of a sheep was a lot worse than the taste. It wasn’t bad but that could’ve been because I put a lot of salt on it. It is also tradition for boys to go through a rite of passage to transition to manhood, in which a sheep is sacrificed. So sheep are a big part of the cuisine and religious tradition. A street vendor cooking a sheep head over the fire. The sheep head I got to taste a bite of! In Langa there is also a variety of living situations based on socioeconomic status. The middle class members live in full houses collected in one section of the township. The lower class community members live in hostels. Mike brought us to see a couple different hostels on our tour. There are older hostels where up to 6 people live in a room about 12’ x 10’ and they share a common space and bathrooms with 5 other rooms. This means that at times there can be 36 people sharing the same kitchen and bathroom. These living conditions were hard to see and experience because they wouldn’t be ideal for anyone. The room we went into was where a 16-year-old girl lived with her family; it was hard to imagine what it would be like to have to do all of my homework and apply for college in a tiny room filled with my family. It put into perspective what living conditions I grew up with and am used to compared to and how I complain about my dorm room being small when I only share it with one person, not five others. The government knows that these living conditions need to be improved, so they have started renovating the hostels. The newer ones are much nicer. They still have one bedroom with up to 6 people, but there is only one room sharing a common area, which is much more homey and comfortable. It was nice seeing that improvements are being made, but it is not happening at the rate that it needs to be. 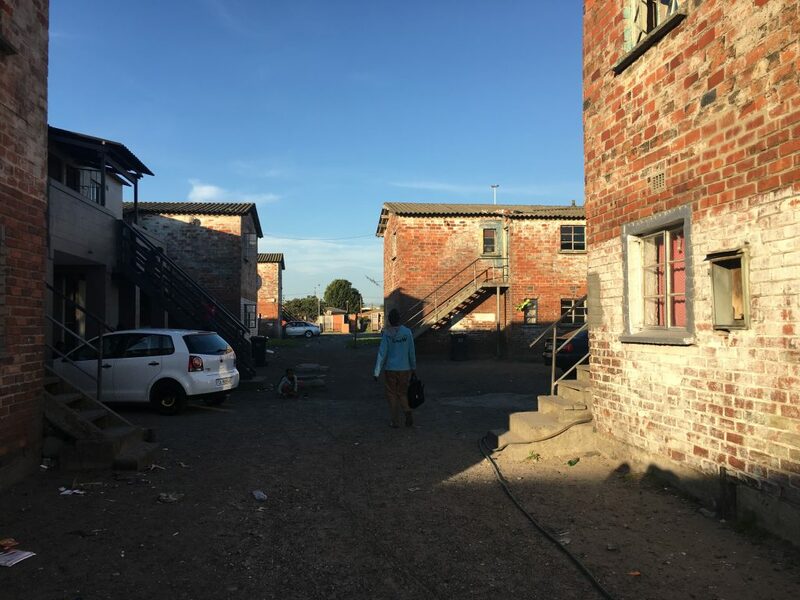 Rows of older hostels in Langa. 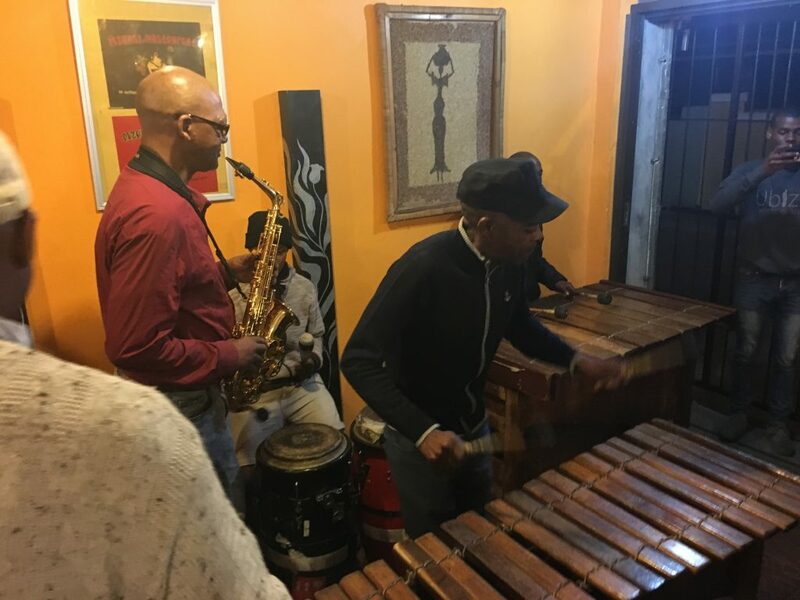 After seeing the township and experiencing a little bit of their daily life, we went to a restaurant in the township, Mzamzi, and got to taste traditional Xhosa food and listen to an African band during dinner. The woman who runs the restaurant and cooked our meal came out to Welcome us to Langa and told us the story about how the restaurant came to be. She told us that she wanted people to be able to experience a different part of Cape Town and see that townships are not all dangerous but have a rich culture in themselves. Her restaurant is ranked number one in Cape Town on Trip Advisor which is an incredible accomplishment for her and her community. The food was delicious and included traditional foods such as samp and beans, beef stew, umngqusho (dried maize and bean mélange) and my favorite part, malva pudding for dessert. After eating, her husband came out and got us dancing to the African band and we even got to play the instruments for the last song. It was a very fun way to end the night, seeing how excited the people of this community were to share their culture with us! The African band playing at Mzamzi while we were eating. We got a chance to play some of the instruments pictured! 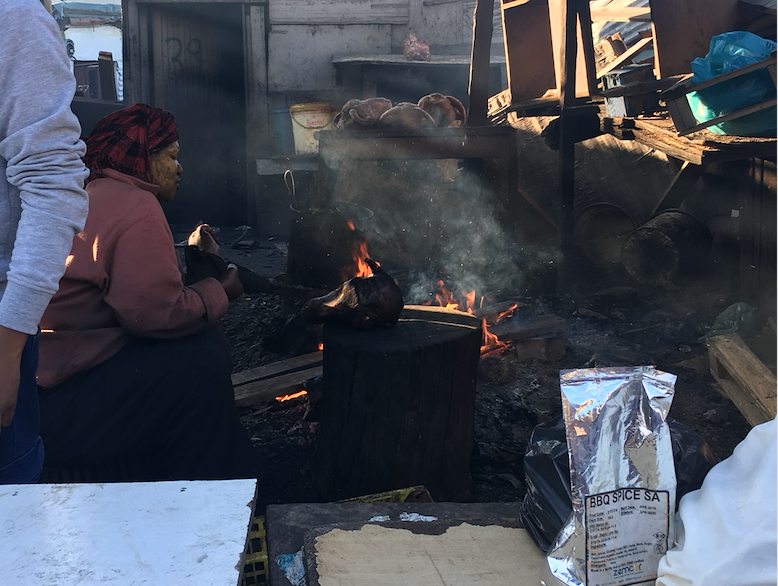 Experiencing Langa was eye-opening, allowing me to gain a better understanding of what life is like for many South Africans. Some of my peers at UCT will have come from townships such as this, and I hope I will be able to learn more about life in townships through talking with peers and experiencing more of them throughout my time here. There is so much culture here in Cape Town and so much depth to each aspect of it, I can’t wait to discover more!